My sister's Sapphire Radeon HD 6850 (the non reference cooler design) also have this issue, there's a minute bending and the PCB is somewhat thin as well, maybe because the fan shroud was not supported by the display output plate, was expecting it to be thicker (PCB) for a good brand such as Sapphire. I saw in another thread that someone had solved that problem by simply using a stack of lego blocks to support it so why not give that a try? Even this one bends a little at the end- adjusting Mobo slightly has improved it but this is a heavy card. 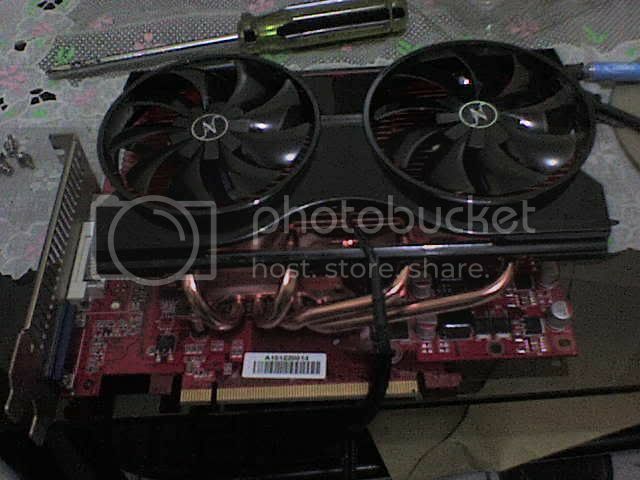 @Norton: thing is, the sapphire hd 6850 is not that heavy, my palit gtx 460 se with a slapped DeepCool V4000 cooler is much heavier but it remains sturdy, maybe because its shorter. I believe the Op was talking about a 6870, which is a little longer than a 6850 so it may bend a little more. Your sisters 6850 may be an issue of the case/mobo connector being slightly off of 90 degrees. The 460 SE is shorter so that may help- is the GPU closer to the backplate as compared to the 6850/6870? @Norton: Yeah, i knew OP was talkin about the HD 6870 from Sapphire as well, i just had a similar experience with the 6850 variant. The board and chassis is align fine. From day 1 when it was purchased more than a year ago, i already noticed how thin the PCB is and i already suspect it to bend a little when it gets older (its slightly thinner than the 460se i have). My GTX 460SE is indeed short, even shorter than the original 460SE reference. The display output plate and the PCI-E slot seems to help make it sturdier. You are right about the age affecting the PCB... my card has sagged more with age and a thinner PCB won't make it sturdier. I guess the consensus solution is a stack of Lego's to hold up the back of the card. I don't think its to do with the length. I took my reference cooler off my 8800 ultra and fitted a custom one without any support and the card still does not bend and its longer than my 6870. The pcb is stronger and has no give in it whatsoever. It's simply down to the thinner pcb used in addition to the type of cooler.